The Rawene House, a mindfulness compound designed for a sound healer by Stevens Lawson Architects and Katie Lockhart Studio, is located in the Auckland suburb of Westmere. 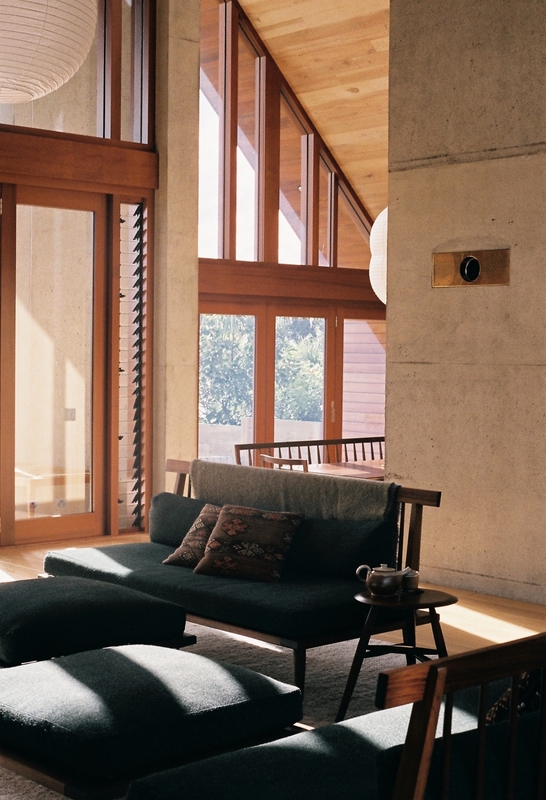 The architects built the steel-free timber house with a cast concrete wall, a cedar shingle steep angled roof, and passive design techniques in order to minimize toxins and electromagnetic radiation. As the build was under way, Stevens Lawson brought on designer Katie Lockhart to develop a “soulful, monastic house with a sense of serenity,” she says. 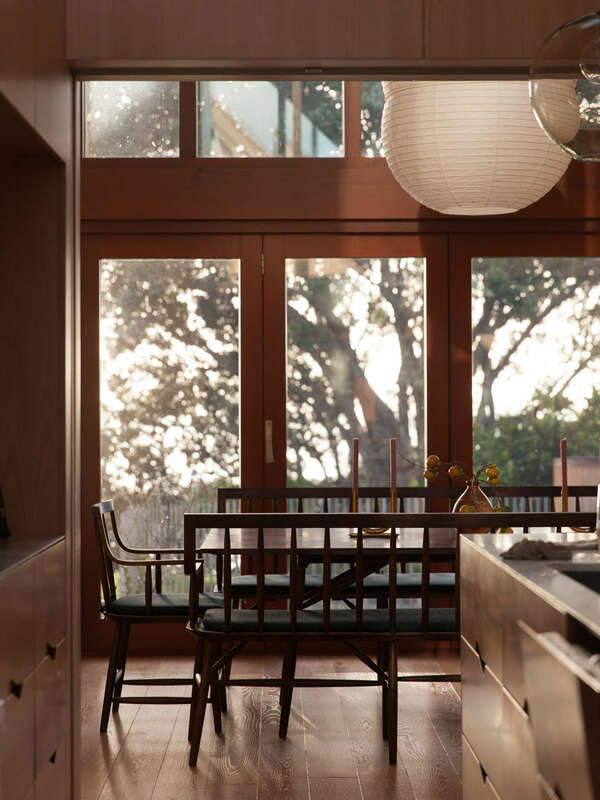 Lockhart was inspired by the “reduced elegance” of Shaker furniture and the George Nakashima House in New Hope, Pennsylvania, as she “furnished the house in its entirety, right down to the last details of towels, cutlery, and bed linen.” Good thing Lockhart has an eye for exceptional objects—she’s the founder of one of our favorite shops Everyday Needs. Here’s a closer look. Photography by David Straight, Mark Smith, and Harriet Were, courtesy of Katie Lockhart Studio. Above: The dining room furniture is by Sawkille in Rhinebeck, New York: the Penn Table, Senate Chair, Senate Bench, and Tall Stool all in American black walnut. 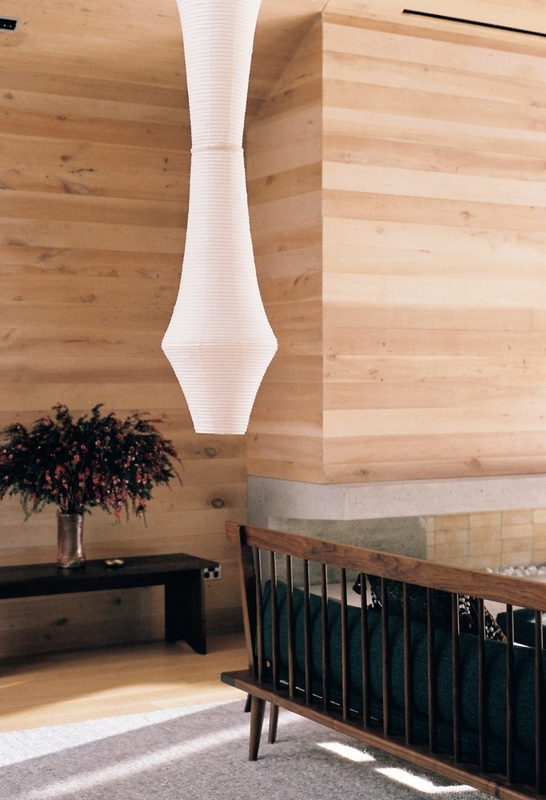 The lamp is the Hotaru Double Bubble Light made by Barber & Osgerby for Ozeki & Co. Ltd.—the Japanese manufacturers of Noguchi shades. Photograph by David Straight. Above: Katie Lockhart Studio designed the walnut frame sofas and ottomans with designer Grant Bailey. The pillow covers are made from vintage Kilim rugs and the throw is made in New Zealand by Godmother. 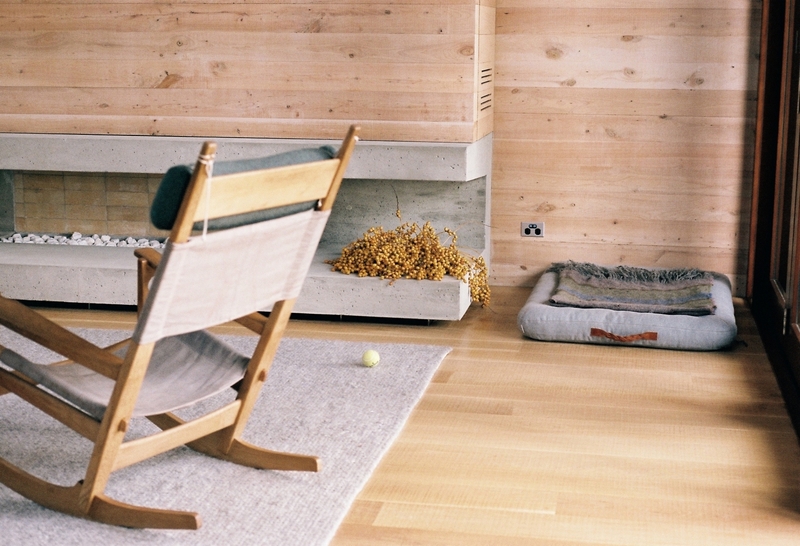 Above: A cast concrete fireplace, vintage Hans Wegner Keyhole Rocking Chair, and Cloud 7 Dog Bed with a Godmother blanket. Above: One of the Bailey and Lockhart sofas and a walnut bench. 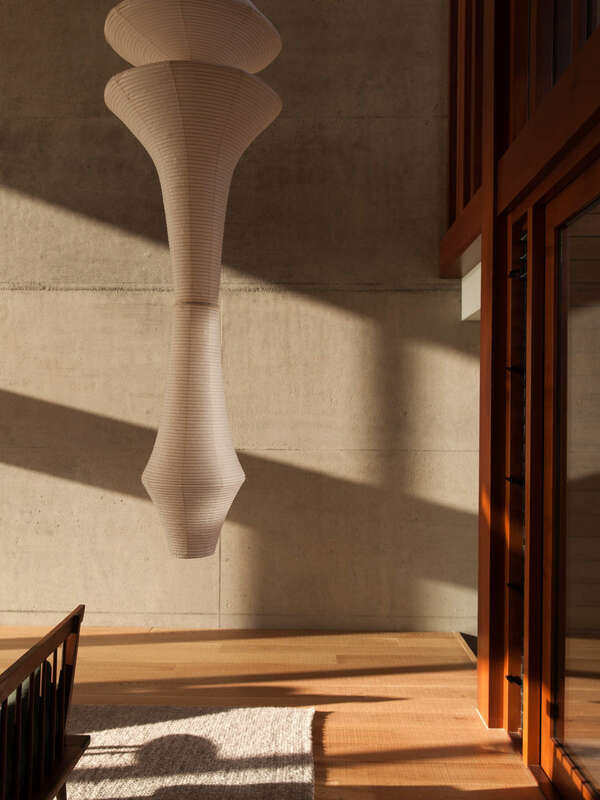 Above: A Noguchi Akari Light Sculpture Model E hangs above a New Zealand wool rug. 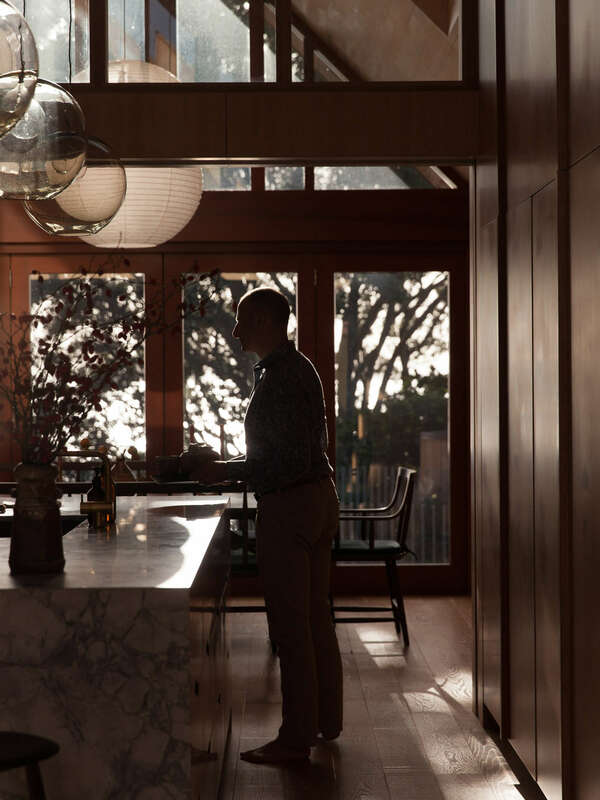 Above: The owner stands at the granite-topped kitchen island. The rest of the kitchen features custom-milled cabinets, granite countertops, faucets from Vola, and glass lamps by glassblower Katie Brown in Whanganui, New Zealand. Photograph by David Straight. Above: The back of the house has glass doors and windows that overlook the Westmere waterfront. 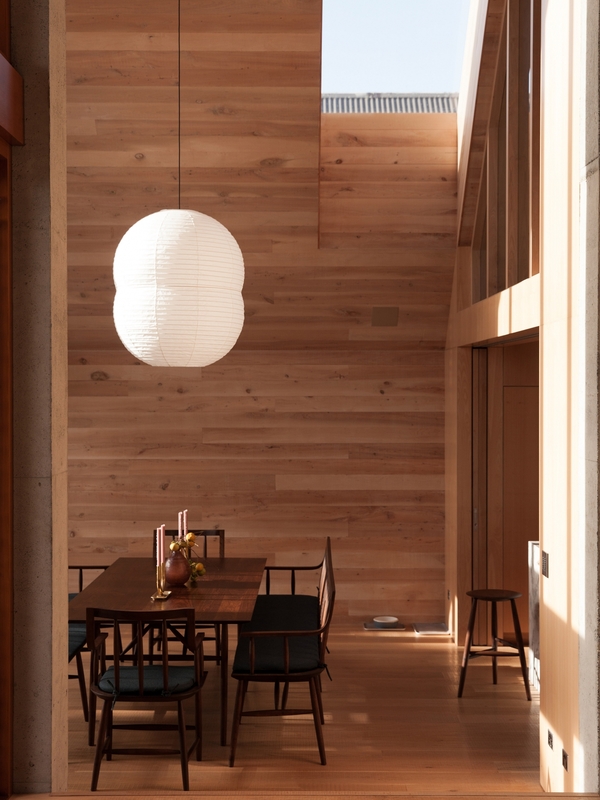 In addition to the emphasis on natural materials and finishes, Stevens Lawson equipped the house with solar panels, rainwater harvesting, LED lighting, and a charging station for an electric car. 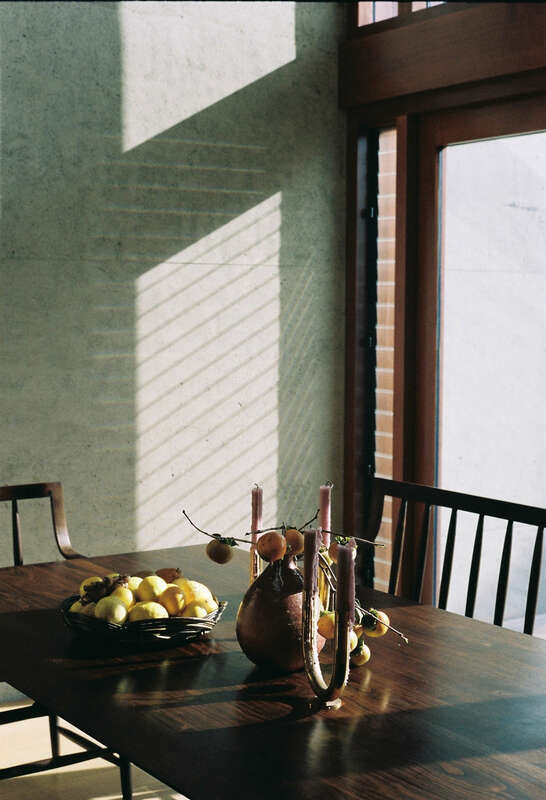 Above: Lockhart sourced the woven Polish Bread Basket from March in San Francisco, the brass U Candleholders from Minimalux, and vase from Bruce and Estelle Martin of Kamaka Pottery in New Zealand. Photograph by Harriet Were.